As promised, we’ll introduce you to this concept of desirable difficulties and to some specific desirable difficulties that are proven effective for learning, memory, and later application, but we’ll begin with a quick introduction to some of our common mistakes about learning. But, as you’ll see, neither is always true. Pretty amazing, huh? Speaking of counter-intuitive, this is a big one: we’re bad judges of how much we have learned from a learning activity. You will remember from your statistics that correlations go from -1 to 1. Correlations between -.30 and .30 are considered weak correlations. Having a correlation of .09 is practically no correlation at all. It would be like correlating the household level of peanut butter use with the household level of television use. So your takeaway here is that we’re not great judges of what helps us learn and what doesn’t help us learn. If you’d like to learn more about how to learn, check out our Lifelong Learning and Learning to Learn article. Ask people how they learn and they’ll often tell you their a visual learner (they learn by seeing), an auditory learner (they learn by listening), or a kinesthetic learning (they learn by doing). This is because a lot of people have heard of the theory of learning styles. I’d guess that it’s one of the very few theories about how people learn that a large percentage of people have ever head of–along with adult learning principles, perhaps. Because this theory of learning styles is so well known, it’s often something learning and development experts take on faith, and as a result they may try to develop training designed with these different learning styles in mind. But here’s the catch: there’s no evidence that designing training with this idea of different learning styles in mind improves training, and in fact the studies that have been conducted on this issue have shown that designing training to try to account for different learning styles actually decreases the effectiveness of training. How’s for that for unexpected? We won’t get into this in detail, but feel free to read more at the Debunker Club’s Learning Styles Are NOT an Effective Guide for Learning Design article and/or read a similar explanation about the lack of evidence behind learning styles in our interview with Dr. Will Thalheimer in which we discuss learning myths (such as learning styles) and evidence-based learning practices. School kids and college students are famous for cramming. We often laugh about that. And yet, adults do the same thing, even if we don’t also turn around and make fun of ourselves. But the results are equally poor in either case–cramming doesn’t lead to the creation of long-term memories or assist with later retrieval, transfer, and use of information on the job and it isn’t an effective skill builder. Rereading text and massed practice of a skill or new knowledge are by far the preferred study strategies of learners of all stripes, but they’re also among the least productive. By massed practice we mean the single-minded, rapid-fire repetition of something you’re trying to burn into memory, the “practice-practice-practice” of convention wisdom. Cramming for exams is an example. Rereading and massed practice give rise to feelings of fluency that are taken to be signs of mastery, but for true mastery or durability these strategies are largely a waste of time. It’s ironic that many of us rely on a training method that we’d also agree isn’t very effective, but I’m betting you agree it’s true. You may never have explicitly thought of this, but it’s probably something you assume to be true anyway: if a learning event is designed to make it easier for the learner, it will in turn be easier for the learner to learn during that training event and to later apply the new information and skills on the job. That’s at least one reason why we spend time thinking out things like chunking and sequencing and even formatting written materials. And the fact is, sometimes it helps to do some planning to “smooth out” training and make it easier for the learner. But research shows that in certain specific instances, it helps to make learning a little harder for learners. This is what learning professionals call desirable difficulties, and it’s what we’ll talk about below. We’ve mentioned earlier that it was learning and memory expert Robert Bjork who coined the phrase desirable difficulties to describe specific techniques in which learning effectiveness is improved when the learner has to work harder to process the information. 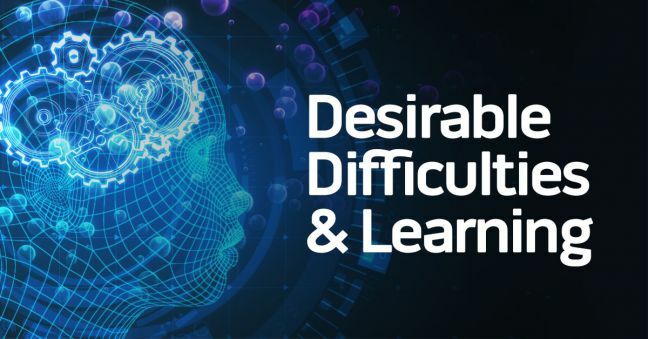 Watch the video below to see Dr. Bjork introducing this idea of desirable difficulties for learning. So to summarize the video above a bit, Bjork is saying that these desirable difficulties challenge learners, make learner a little harder, and even make it seem as if the learner is initially learning more slowly. You can see why when a person is participating in a learning event, and they’re forced to work harder and may not even seem to be learning as quickly as they might in a different learning setting, they may resist the training method or even assume that the learning strategy isn’t effective. That’s the counter-intuitive aspect of some of these desirable difficulties for learning. But they’re worth using because they do increase learning, long-term retention, and later transfer. One desirable difficulty that improves training is to ask the learners to do or explain something before you’ve actually taught them to do so. This process forces the learners to actively struggle to create knowledge, and that ultimately leads to a more effective learning experience, even if they don’t successfully perform the task or explain the knowledge in their initial attempts. This process of asking before telling gives the learners a chance to generate their own answers based on their previous knowledge, skills, and experience. One tip is to make sure you ask them to generate knowledge that’s close enough to their prior and/or current knowledge that it’s not an impossible task. One of the desirable difficulties that learning professionals speak of most often is the idea of spacing out practice on a given skill (or application of knowledge) so that the learner is exposed to it repeatedly over time. For more on this topic, see this article on Combatting the Forgetting Curve, this article on using Spaced Practice in Training, and this interview with Dr. Will Thalheimer on Spaced Learning and Evidence-Based Training Methods. The idea of spaced practice or spaced learning is to do the opposite of what we do during massed practice (which you may know as cramming). Introduce new knowledge or a skill in training with an employee in an initial training session. By the end of the session, you’ll probably see a great improvement in the employee’s ability to use the new knowledge or skill. But once the training is completed, the employee’s ability to use that new knowledge or skill will quick erode–this is what learning professionals call the forgetting curve. You can then schedule another training (or similar opportunity) in which the employee is exposed to and has to use that knowledge or skill again. Because the knowledge or skill has eroded since the initial learning event, the learner will struggle to retrieve the knowledge or skill. But that struggle is a desirable difficulty that will actually ingrain the learning more deeply and securely, ultimately strengthening the learner’s mastery of the knowledge or skill. You can then continue to space practice out over time, with each repetition strengthening the long-term memory and ability to later apply the information or skill on the job. During that spaced practice (just discussed above), you’ll want to force the learners to try to retrieve the information or skill from the previous training. Do this instead of just telling or showing the learners, because the act of retrieving the information is another desirable difficulty that builds long-term learning. In particular, have the workers recall the information on their own, which really gets the gears in their brain grinding, and avoid simply having learners recognize the information, as they would if it were presented in an answer-option in a multiple choice question. Recall is harder than recognition, and so it facilitates deeper, more impactful learning. So retrieval practice is just general conception, people retrieving information from memory. And retrieval practice is just giving people information and having them practice retrieving that information. You know, if want a baseball shortstop to learn how to be a better shortstop, we give them lots of practice with ground balls, and have them throw it over to first base, right? With our learners, what are they going to have to be doing to use the learning? They are going to have to retrieve that information in order to use it. So we ought to give them practice in that retrieval. And that ought to be realistic, and not focused on knowledge and facts that are not useable, but focused on things things they can really use. So it’s just sort of the general concept, where people are remembering information. Recall is often contrasted with recognition. And this is research kind of talk, and most of us don’t have to worry about this too much, but in research studies on recall, we might ask a learner “OK, you just read this passage, write down everything you can remember.” Or we could have cued recall, like “What is the capital of Pennsylvania?” So we cue them with the question, and they have to retrieve it by themselves. While on the other hand, with recognition, where we say “What is the capital of Pennsylvania?” and we give them some choices (Dover, Saskatchewan, Harrisburg) and the learner recognizes “OK, it’s Harrisburg.” So that’s recognition. And from a learning standpoint, the more difficult that retrieval is, the better, so recognition tends not to be as good from a learning standpoint. Variation is another idea that is related to spaced practice. Variation means introducing a learning topic to a learner in different manners, from different perspectives, or in different contexts. So for example, you could introduce a specific topic by presenting a problem at one point, and then introduce it again by telling a story at a different point. Or, you could have learners apply a specific skill in one context and then have them apply the same skill in a different context later. The evidence favoring variable training has been supported by recent neuroimaging studies that suggest that different kinds of practice engage different parts of the brain. The learning of motor skills from varied practice, which is more cognitively challenging than massed practice, appears to be consolidated in an area of the brain associated with the more difficult process of learning higher-order motor skills. The learning of motor skills from massed practice, on the other hand, appears to be consolidated in a different area of the brain that is used for learning more cognitively simple and less challenging motor skills. The inference is that learning gained from the less challenging, massed form of practice is encoded in a simpler or comparatively impoverished representation than the learning gained from the varied and more challenging practice which demands more brain power and encodes the learning in a more flexible representation that can be applied more broadly…The benefits of variable practice for cognitive as opposed to motor skills learning were shown in in a recent experiment that adapted the beanbag test to verbal learning: in this case, the students solved anagrams–that is, they rearranged letters to form words (tmoce becomes comet). Some subjects practiced the same anagram over and over, whereas others practiced multiple anagrams for the word. When they were all tested on the same anagram that the former group had practiced on, the latter group performed better on it! The same benefits will apply whether you are practice to identify tree species, differentiate the principles of case law, or master a new computer program. Let’s say you’re a safety professional who has to deliver safety training to new employees, and you have to deliver training on 5 different safety topics (emergency exit plan, lockout-tagout, hazard communication, personal protective equipment, and mobile equipment/pedestrian safety). But even though the idea of blocking the training topics in that manner seems logical (and easy for the learner), research shows you’ll get better learning results if you mix the topics up while also spacing them out. This desirable difficulty of mixing the topics up is known as interleaving. Every time you introduce a new (or return to a previously discussed training topic) in this interleaved format, it will initially make it harder for the learners to adjust. But that’s good–it’s another desirable difficulty that gets the gears grinding and that ultimately strengthens learning. Because some people get nervous during a test, it may seem like a good idea to avoid testing during learning experiences. But research shows that testing actually aids the learning experience–this is known as the testing effect. One benefit of testing is that it provides an opportunity for the learner to self-assess his or her own level of understanding. This is part of metacognition, the process of thinking about our own thinking, and if a learner can do this on his or her own, it can be very helpful. Of course, testing also gives the instructor an opportunity to judge the learner’s progress, understanding, and performance, and to provide corrective feedback as well (see this two-part white paper on providing learners feedback for much more on this topic). But in addition to assessing the learner’s knowledge and skills during training, and in addition to providing helpful corrective feedback, the simple act of testing actually improves comprehension, retention, and later transfer on the job. This is true even if the testing is low-stakes or no stakes…like a practice quiz. So it’s not a bad idea to repeatedly test employees on the same topic. One thing to be aware of is that the term desirable difficulties implies that there are undesirable difficulties as well. Another way to put that is that just because research has shown that the desirable difficulties discussed above (plus those in the resources linked below) improve learning, it’s not true that everything that makes learning more difficult improves learning as well. So, the fact that there are desirable difficulties doesn’t mean you’re free to not bother designing training (because that will make it a more difficult learning experience) and it doesn’t mean you can do things like yell at the learners (because it’s difficult to learn when someone is yelling at you). Those are examples of undesirable difficulties. It’s also important to remember that your goal is to stretch the learner a little bit but not make it impossible for the learner. So, for example, when asking learners to generate knowledge before you teach it, be sure their prior knowledge gives them a real chance to do it. The processing at encoding should be the same as the processing at retrieval. The processing at encoding should be the same as the processing during practice. The task must be able to be accomplished. Too difficult a task may dissuade the learner and prevent full processing. Source: Marsh, E. J.; Butler, A. C. (2014). Memory in educational settings. Chapter in D. Reisberg (Ed.) Oxford Handbook of Cognitive Psychology. pp. 299–317. Let us know if you’ve been using desirable difficulties in your training and what your experiences have been. We’d love to hear more. And before you go, please download our free guide to writing learning objectives!